We’re kicking off into a new global arms race. You can like it or not. You can invest in it or not. But the new arms race is happening, and you owe it to yourself to understand the facts. Watch the world through this lens, and many things will become clearer. Last week’s Russian air show around Europe is just one of many similar incidents. In recent months, Russian aircraft have probed Alaska airspace, and flown down off the coast of California. Russian aircraft have moved near northeast Canada, into simulated “launch” positions for missile strikes on, say, Norfolk Navy Base… or Washington. The short answer is Ukraine. Russia is responding to NATO encroachment eastward, to a Western-backed coup against the previous Ukrainian government (no matter how bad it was), to U.S.-NATO ships in the Black Sea, and to constant Western military surveillance. Beyond Ukraine, however, we have a long string of events that unfolded since the breakup of former Yugoslavia in the early and mid-1990s. Think Serbia, Kosovo, Iraq, Afghanistan, Libya and more. Russians view these Western military expeditions as encircling moves. At the level of policy-politics in the U.S. — in much of the West, actually — the leadership class seems to have been near oblivious to what’s happening. It’s not hard to make the case that, in the U.S., the Clinton-Bush-Obama administrations have walked (perhaps “sleep-walked” is a better term) into serial buzz saws of confrontation; and Russia is but one aspect of the multi-dimensional competition that’s breaking out. Add in China, which continuously displays more and more willingness to stand up for its perceived self-interests. Plus, we must deal with other aggressive players such as Iran, “Militant Islam” and several so-called “emerging” societies across the world. It’s becoming more and more complex, pretty much every month. Don’t take my word for it, though. Here’s what no less than the president of Russia, Vladimir Putin, said last week. He took the proverbial gloves off and ripped into the U.S., NATO and the West in general, at a major speech in Sochi. The theme of the Sochi gathering was, “The World Order: New Rules or No Rules?” Right away, it’s clear that the forum was based on Russian perceptions that the West has worked to overturn the pre-existing global order since the fall of the Soviet Union. What are the rules? Or are there no rules, except those that the U.S. and allies make up as they go along? Putin flat-out accused the U.S. of undermining the post-Cold War world order. He predicted that, absent a new system of global governance, the world will collapse into chaos and anarchy. Looking back, and if you’re old enough to remember the original Cold War of the late 1940s through about 1990, you may shake your head and think, “Oh man… not again,” or something like that. You don’t have to like the idea of a new level of great power confrontation; but at least you ought to get ready to deal with it. This is NOT your father’s Cold War; it won’t be a simple replay of the first one. The next struggle will cover all manner of land, sea, air and space domains, plus cyberspace. It’ll involve military hardware, to be sure, but it will also require policymakers with keen knowledge and understanding of economics, energy, trade flows, cultural differences, religions and much more. The next arms race won’t necessarily be based only on which economy — Capitalist or Communist — can build more ships, tanks and airplanes, although my hunch is that the Russian economy (and Chinese economy, too, while we’re on the topic) can produce lots of ships, tanks and airplanes if the need arises. 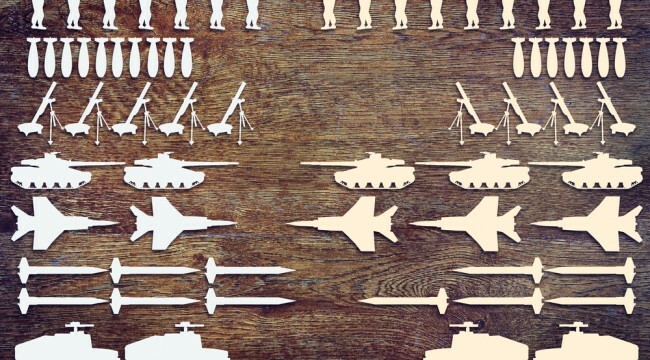 The next arms race will move into entire new levels of battle space. Land, sea and air, of course. Outer space too, but in ways far surpassing what we saw in the old U.S.-NATO versus Soviet competition. Add in cyber — the “Fifth Domain of War,” as I’ve discussed many other times; software is asymmetrical, in its own way. It brings me back to why I started writing these missives, and I suspect why you subscribed. You can see what’s happening; and this free e-letter brings you an investment angle to marry up with what’s in the headlines, as well as deep inside the “professional” level academic, policy and trade press. P.S. We’re monitoring the global arms race and investment angles on your behalf in the Daily Reckoning email episodes — free to you as a subscriber. Our missives are the most informative and entertaining 15 min. read of your day. But if you’re not signed up you miss out on all of the context and laughs our analysts provide. And you won’t find them all here on our site. Sign up now to receive our daily reckonings at no charge.